Lara Fabian has announced that her world tour will kick off in North America beginning February 2018. After selling more than 20 million albums worldwide, Fabian is returning to the international scene with her 13th studio album, Camouflage, consisting of 12 songs, written and composed by Fabian together with Sharon Vaughn (USA) and Moh Denebi (Sweden). The Camouflage World Tour launches in the USA on February 2 in Miami, Florida, and spans 40 dates worldwide, culminating in a Paris show in June of 2018. The Camouflage World Tour is Lara Fabian’s first tour based on her English-language repertoire, which started with the release of her self-titled U.S. album in 1999. The album, written and produced by some of the most respected figures in the music industry including Glen Ballard and Walter Afanasieff, featured several titles that topped the Billboard charts, such as the #1 Billboard dance/pop hit I Will Love Again. Other titles, such as Adagio, Love by Grace, and Broken Vow were global hits covered by many artists. Following her initial success, she released a second English album in 2004 titled, A Wonderful Life featuring Review my Kisses, written by Desmond Child, I Guess I Loved You and No Big Deal. The dance/pop song I Am Who I Am, remixed by Hex Hector quickly became an underground club hit. 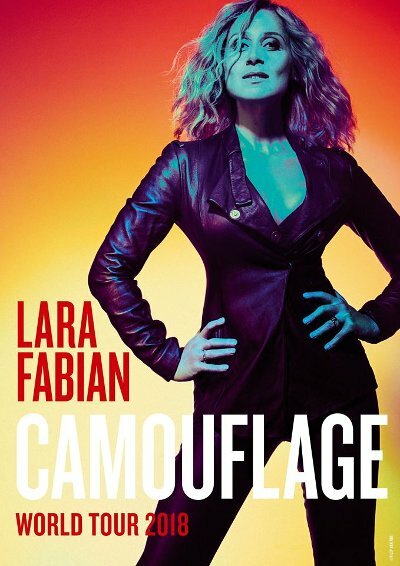 The highly anticipated Camouflage was released on Oct. 6, 2017, as Fabian’s first original English album in more than a decade. Co-written and co-composed by Fabian — together with Moh Denebi and Sharon Vaughn, and produced by Moh Denebi (Stockholm/Los Angeles) — Camouflage revisits Fabian’s vocal-pop roots combined with a contemporary progressive pop sound that is Moh Denebi’s signature. The first single from the album, Growing Wings, was released on Aug. 4, 2017.